This is the most numerous seabird in Britain and Ireland, with a breeding population of about one million pairs (Mitchell et al 2004). The Guillemots found in winter in our area are most likely to be from colonies in western Britain or Ireland. Immature birds, below the age of five years when they normally start breeding, spend the winter significantly farther away than adults, with median distances of around 600 km and 350 km respectively and most birds moving south or east (Migration Atlas). Probably most of the birds off our coasts are immature birds, for many adults return to their breeding ledges from October onwards, after the males have finished feeding their chick on the water and as soon as they have regained the power of flight following their autumn moult (BTO Winter Atlas). The winter Atlas map fairly shows this species’ typical distribution in the county, entirely coastal and mainly clustered around the northwest Wirral. Maximum counts of 30, 6 and 66 were submitted from Hilbre for the three winters, and very large flocks of 120 and 450 birds were reported in November 2004 from two tetrads on Hoylake shore (SJ28E and SJ29A), flying west after gales eased. Elsewhere in the outer Dee or north Wirral coast, one or two birds were found in several squares. Coward (1910) wrote that the Guillemot is plentiful in Liverpool Bay in the summer months, and is often driven close inshore in winter. He noted that dead bodies of the auks could be found lying amongst the tideline debris at any time of year. Bell (1962) described the species as common in small numbers off the coast at any time outside the breeding season. Most birds in winter were alone or in parties of fewer than ten birds, although strong winds could change the picture, with 44 counted after gales on 6 January 1957. The histogram of Hilbre records for 1957-1977 shows an average of about 30 bird-days each winter (Craggs 1982). Most subsequent annual bird reports for the county indicate winter presence in small numbers, although unfortunately few counts are given until 2002; flocks of 25 on 25 November 1984, 50 on 24 December 1991 and 25 on 9 February 2002 were singled out for mention. From 2002 onwards, the monthly maxima at Hilbre were tabulated, with peak figures for each month of 20 in November (2005), 35 in December (2006), 30 in January (2005) and seven in February (2002), with 85 counted off Hoylake on 27 November 2003. The lack of data in Cheshire and Wirral Bird Reports precludes any comparison with the numbers off the coasts of Lancashire and North Merseyside, where there has been a dramatic decline in sightings of Guillemots since about the mid-1990s, for unknown reasons (White et al 2008). Away from the northwest corner of Wirral, few birds are found in Cheshire and Wirral. There is only one record in a county bird report at the Mersey end of the Wirral coast, one at New Brighton on 6 February 1983, a date coinciding with one of the biggest recorded incidents of mass mortality of auks in the North Sea and Scotland (BTO Winter Atlas). 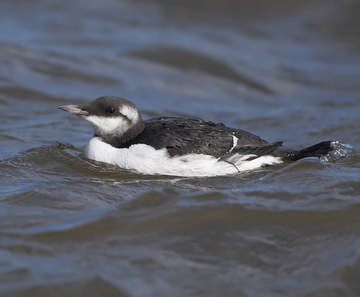 Guillemots occasionally move as far up the Dee estuary as Burton, but inland records are rare, with just five birds found in the last forty years (CWBRs). Their preferred diet is squid, pelagic worms and crustaceans, difficult to find away from the sea.